August 13, 2018 – We welcome Fiona Davis back into our time machine, where she’ll be painting a fresh story of art, mystery, intrigue, lies and love. The book is . 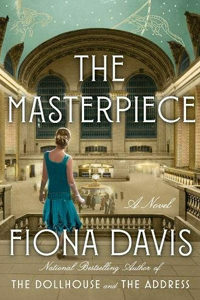 If you enjoyed Fiona Davis’s previous works — The Dollhouse , about the famed Barbizon Hotel for Women, and The Address , which stars the legendary Dakota apartment complex — you’ll want to hop a train for The Masterpiece: A Novel . It’s set in the Grand Central Depot of its 1920’s heyday and the 1970s, In those dark days, wrecking balls threatened obliteration, a fate avoided through the efforts of Jackie Kennedy and a group of dedicated New Yorkers. You can enjoy my chat with Fiona about that sophomore novel, The Address, in our archives at HistoryAuthor.com or wherever you’re listening. Visit Fiona online at FionaDavis.net, Facebook.com/FionaDavisAuthor or @FionaJDavis on Twitter.